The Perth Mint Chinese Lunar Series is one of the most famous and popular coin series ever produced. Beginning in 1996, this series celebrates a new design each year for the 12 animals of the Chinese zodiac. 2018 is the Year of the Dog and Monument Metals is proud to offer an early opportunity to own this extremely popular series at what we believe are the lowest prices online. These coins are popular with investors and collectors alike for a variety of reasons. The design is changed every year which makes this an excellent collectors item. They are offered in a wide variety of sizes to fit the individual needs of the collector/investor. Silver issues are available in 1/2 oz, 1 oz, 2 oz, 5 oz, 10 oz, kilo and 10 kilo sizes. The gold issues are available in 1/20 oz, 1/10 oz, 1/4 oz, 1/2 oz, 1 oz and 2 oz sizes as well. Each coin comes pre-packaged by the Perth Mint in a specialty hard plastic coin capsule that fits its size perfectly. On top of that, each coin is produced with a beautiful frosty-mint luster that makes the design hold up well over time. 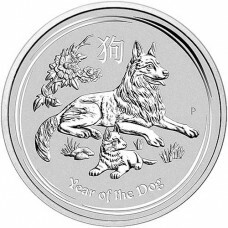 All in all, the Perth Mint 2018 Lunar Series Year of the Dog is bound to be one of the most popular bullion releases of 2018. Get yours while they are still available! Cointains 1/10 troy ounce of pure .9999 gold. Considered legal tender by the Government of Australia (Face Value of $15 AUD). Individual coins are shipped in the original mint-sealed capsules. Obverse Design: Traditional bust of Queen Elizabeth II along with the date, purity (1/10 oz .9999 gold) and face value of the coin ($15 AUD). Reverse Design: Brand new for 2018. The reverse depicts a German Shepherd dog and pup lying in grass with Chinese peony flowers in the background. 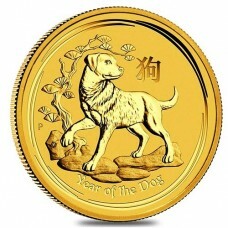 The design also incorporates the Chinese character for ‘dog’, the inscription ‘Year of the Dog’ and the Perth Mint’s traditional ‘P’ mintmark. The Perth Mint is Australia's official bullion mint. The facility produces coins and bars in gold, silver and platinum. It was established on June 20 1899, just two years before Australia's Federation in 1901. The Perth Mint was the last of three Australian colonial branches of the United Kingdom's Royal Mint (after the now-defunct Sydney Mint and Melbourne Mint). It was intended to refine gold from the gold rushes and to mint gold sovereigns and half-sovereigns for the British Empire. Along with the Royal Australian Mint, which produces Australia’s circulating coins, the Perth Mint is the older of the two mints issuing coins that are legal tender in Australia. Beautiful New Release From The Perth Mint! Availability Pre-SaleExpected To Ship On Or About 10/6!